Did you know that the Niagara Falls pours over 5 billion gallons of water hour? What if the same amount of gasoline was poured over the falls for at least 200 million years and burned? Amazingly, the ending result would produce the same amount of energy as the sun does in just 1 hour. Why would you not take advantage of that free, environmentally-friendly energy? 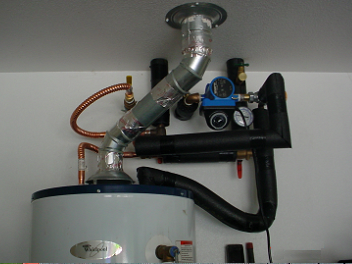 There are two types of Solar Hot Water Systems; active and passive. There are many types of designs in both categories. Wing Solar & Wood Energy, Inc. prefers the Passive Thermosiphon System because there are no moving parts. With no moving parts it does not use energy to collect energy and less maintenance required. A 30% Federal Income Tax Credit is available for installing solar hot water systems. 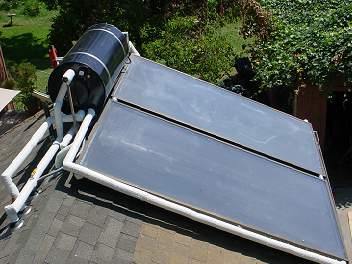 If you are till asking yourself, "How does a solar water heating system benefit me?" Below we have summarized additional benefits that every homeowner should know. There are endless reasons to go solar. We will keep it simple! Here are five of the most valuable reasons why solar is your solution. 1. FREE Energy - Solar energy comes from the sun. Heat from the sun provides pure and free energy to heat your home’s hot water and even your swimming pools. 2. SAVES Money - Solar power can literally save thousands of dollars over time. In addition, with all of the solar tax incentives, you can enjoy even greater savings. 3. Saves Our Global Resources - Going solar means you also are saving our environment because solar power does not pollute our atmosphere. Solar power also eliminates the use of green house gases, harmful pollutants, and fossil fuels. 4. Increases Your Property’s Value - Installing a solar system means that you could potential increase your property value by as much as 10%. 5. Low Maintenance - Solar panels typically last over 15 years. Solar power units have few moving parts. Once we install your panel, there is very little ongoing maintenance required. Switch to Solar and Save! The California Energy Commission estimates that a typical homeowner currently using electric or gas water heating can save 60% - 70% on the cost of water heating by installing a solar water heating system. With record high gas and electricity prices, this translates to a savings of up to $750 a year. Active solar systems have circulating pumps and controls, and typically use 'flat-plate' solar collectors. These solar panels employ insulated metal boxes, copper pipes with black absorber plates, and glazing to produce hot water temperatures between 120° - 140° F for domestic use. Because these systems circulate water through the collectors they are better suited for producing large volumes of hot water. For that reason active solar systems are used for larger homes, or for heating pools and spas. Passive solar systems have no pumps, controls, or moving parts. Passive systems come in two basic designs. One is the "Batch Type" Integrated Collector-Storage (ICS), which operates on in-line water pressure to move the hot water from the ICS to your domestic storage tank. The other type is a thermo-siphon system which has a separate panel and a well-insulated storage tank. These systems use the natural flow of gravity to move the hot water into the solar storage tank located above the panel on the roof. They typically produce between 60 - 80 gallons of hot water per day. The simple nature of these systems provides the most reliable and cost-effective solution for solar water heating on a smaller scale. Multiple units can be connected together to produce greater volumes of hot water. 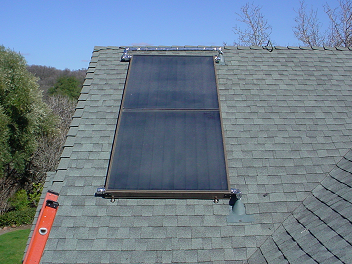 It is also possible to heat the interior space of your home with a solar water heating system. The most efficient way to accomplish this is with an in-floor radiant heating system. These systems send hot water through pipes under the floor to warm the floor and heat the space. This is one of the most efficient ways to heat your home. It is clean and quiet, with no fans or ducts to stir-up dust or pathogens, allowing you to maintain a healthy environment in your home. While in-floor radiant heating systems are more expensive to install, the annual operating cost is approximately 30% - 40% less than a conventional forced-air heating system. With these significant saving s in operating cost, radiant floor heating has a 5 - 6 year payback compared to conventional forced-air heating. You can save even more with solar-assisted in-floor radiant heating. Determining the cost of swimming pool heating is very site-specific. A solar pool heating system has a typical payback period of 2 - 4 years. There are several factors that affect the savings realized with a solar pool heating system. These include, your climate, the size of the pool, your cost for natural gas, the pool temperature you wish to maintain, whether you use a pool cover, the length of your swimming season, your climate zone, etc. To learn more about our solar pool heating systems, please contact our office. For further details about our solar powered hot water systems please contact our office toll-free at 1-800-492-4061. For your convenience, you may also request more information from this site.